Justin Bieber hasn't been in the music business too long, but the 17-year-old has big-time success and chart topping singles. Not only is he on the stage, Bieber is taking time out of his career to help younger artists like Greyson Chance. Giving valuable advice, Bieber contributes to those who have big careers ahead of them in the music business and generously shares his knowledge. Greyson Chance is one of those entertainers helped by Justin Bieber. The 13-year-old entertainer just got off a national tour and has an album dropping in two weeks. Signed by Eleveneleven (Ellen DeGeneres' record label) he was found just like Justin Bieber on a YouTube video. Having so much in common, it seems that Bieber has set aside some time to talk with Chance and help him in his career. According to Chance the entertainers are "friends" and he has gotten some great advice from the slightly older entertainer about who to trust and what to expect. While both are young, their common bond sets them apart from other entertainers who are older, play a different genre of music, but more importantly weren't found online. Additionally, both have elaborate fan bases of younger fans that bring an extra responsibility. The best part of Justin Bieber and Greyson Chance working together just might be for the fans. Knowing that the music is different, but that both guys can put on a show breaths hope into the idea that maybe someday the two will perform together. Give Back Brands has selected SAS & Company, to distribute “SOMEDAY,” the debut fragrance by Justin Bieber in the UK and Eire. The new fragrance is expected to debut in prominent retailers this autumn. Justin Bieber is a global superstar, with a #1 album in 17 countries. He is the undisputed king of social media, with truly electrifying stats: over 1 billion views on YouTube… over 28 million Facebook fans… and over 10 million followers on Twitter. And now he has turned his attention to fragrance-- Justin's inspired approach to his first scent showcases his desire to connect with his fans. Committed to the spirit of giving back, Justin has teamed up with Give Back Brands, to create a fragrance for her, with the profits going to charity. Give Back Brands has a simple vision of partnering with entertainment artists and other top talent to create and market world-class products, then donating the company’s proceeds to designated charities, including the favorite causes of the company’s celebrity partners. Launching in the UK in August/September 2011, Justin Bieber’s new fragrance for his female fans will be available as 100ml, 50ml, 30ml EDP plus a Hair Mist and Body Lotion. It’s been just three weeks since Justin Bieber’s perfume, Someday, made its debut at Macy’s, and it has already become the department store’s biggest celebrity fragrance launch, eclipsing other big names like Rihanna, Jessica Simpson, and Jennifer Lopez. Of course, sales might have experienced a boost due to the fact that the first 325 fans that shelled out $135 for the Someday gift set on June 23rd at Macy’s Herald Square got to take a photo with Justin. Hey, J-Lo! I don’t remember you doing anything like that. Another thing that might have helped sales is Justin Bieber’s dedication to sharing the wealth. He’s donating net profits from perfume sales to the Make-A-Wish Foundation and Pencils of Promise, an organization that builds schools in developing countries. Exclusive Justin Bieber Never Say Never movie clip! Ooo, we have an exclusive Justin Bieber Never Say Never movie clip! JUSTIN Bieber fans listen up, we have an exclusive Never Say Never movie clip! We really hope Justin is secure, the crowd look like they would give a left arm to get hold of the pop poppet. The UK Blu-ray and DVD of Justin Bieber: Never Say Never is out on Monday 25 July! Justin Bieber has hired a nutritionist to deliver girlfriend Selena Gomez three proper meals a day following her health scare. The 18-year-old actress was taken to hospital recently after falling ill. It was discovered she was malnourished, low on iron and exhausted, but after treatment she began to feel better. Selena then explained she loves eating, but the problem is she feasts on the wrong food. Her boyfriend Justin was said to be terrified when he heard how ill she was, so has vowed to help her get back to her best. He hired a nutritionist who has come up with a special diet program for Selena, including three properly-balanced meals which are delivered to her daily. “Justin told Selena it’s his personal gift, to show how much he cares,” a source told National Enquirer. Selena was said to have initially thought she could handle her new food needs with the help of her mother, but soon realised Justin was talking sense. He understands the pressure she is under due to her hectic work schedule, so wanted to make things as easy as possible. 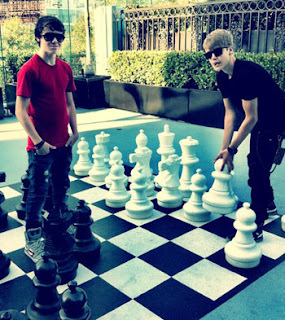 Justin Bieber Plays A Little Chess.. It seems Selena Gomez and Justin Bieber love kids. Of course they're kids themselves, but they love little kids--especially Justin's little brother and sister. The two were seen recently with Jaxson and Jazmyn, and appeared to be having a wonderful time. According to a report from Hollywood Life, the Monte Carlo star and Never Say Never singer love spending time with Justin's 17-month old brother and 2-year-old sister. Hopefully the two aren't getting any ideas about having a baby of their own, however. Justin Bieber and Selena Gomez spent lots of time with the little ones recently while visiting with Justin's family in Canada, but sources close to both camps say the two are sensible and realize they are both too young to have babies--never mind what such a move could do to both of their careers. Still it's one more sensitive side of Selena Gomez and Justin Bieber that their young fans obviously love to see. It's probably a part of the dream world that often consumes tweens--the notion of their favorite celebrities living a life of happily ever after. Justin Bieber will soon head to the recording studio to work on his next album, but before he does, the spunky singer is trying to enjoy the summer as a “normal” teenager—not an easy task, his manager Scooter Braun tells HollywoodLife.com in an exclusive interview. “Justin is taking his time to be a kid right now,” Scooter, the mastermind behind Justin’s incredible career, tells HollywoodLife.com. “It’s hard for him to be a kid. He’s not a ‘normal’ kid. He’s been really gracious with all the pressure. And Scooter says Team Justin takes any negative press with a grain of salt. Case in point? The Women’s Wear Daily report last week that Justin’s February Vanity Fair cover was the worst-selling issue in 12 years, selling 246,000 copies so far. The cover joins the magazine’s other poorly-sold issues: Will Smith‘s July 1999 cover and Harrison Ford‘s July 1993 cover, which sold 202,701 and 243,000 copies, respectively. Justin Bieber and Miley Cyrus for Bowling Honor - Was Selena Gomez Invited? Lil Wayne, Justin Bieber, and Miley Cyrus were just a few of the celebrities recently nominated to be inducted into the 2011 International Bowling Hall of Fame. These celebs and others were named by the Bowling Proprietors Association of America (BPAA) not long ago. Bieber's girlfriend, Selena Gomez, was not named to the list, so she'll have to improve her game and wait it seems. As reported by MTV.com, Bieber, Cyrus, and Weezy were nominated along with the likes of NBA legend Michael Jordan, pop singer Lady Gaga, actor Jeff Bridges, and the curvaceous reality star Kim Kardashian. MTV notes that of all those named, it appears Lil Wayne has the most experience. He participated in an annual NBA charity bowling event featuring other celebrities. Weezy made it into the final round but was defeated by Chris Paul of the New Orleans Hornets and pro bowler Jason Belmonte. Bowling seems to be a popular sport among celebrities, but it's strange to hear Miley Cyrus's name tossed into this field of bowlers. Then again, not many people picture Lil Wayne bowling a lot either. Justin Bieber has been popping up a lot lately in terms of sports events. He recently was seen as a presenter, fan and scream-generating celebrity guest at the 2011 ESPY Awards in Los Angeles. There's no word yet on whether or not he and Selena Gomez have gone bowling on dates, but it may help Gomez get herself nominated for the next round of celebrity bowlers! Justin Bieber set to Return to Studio Soon! With two hit albums under his belt already, Canadian singer Justin Bieber will be heading back into the studio soon to start working on his next album! According to Hollywood life, Justin has been enjoying his youth a bit before getting serious with his music once more. Can’t wait to hear some new music from Justin! Justin was last spotted with girlfriend Selena Gomez as the duo checked out the 2011 ESPY Awards on Wednesday. The ESPYs: Backstage Moments with Baron Davis, Jonah Hill, Justin Bieber, and more! Baron Davis, Jonah Hill, Justin Bieber, Erin Andrews, the Dallas Mavericks, Brian Wilson and many others caught having fun backstage at the ESPYs. Justin Bieber has been no stranger to the sports world this week, scoring big with invitations to attend two athlete-centric events, the 2011 ESPY Awards and the ESPN Magazine Style Studios. At the ESPN Magazine affair, hosted at the W Hotel in Los Angeles, Bieber rubbed elbows with other athletes and celebs the likes of former American football running back Eddie George, Matt Leinart, Charles Woodson and other NFL pros. Also in attendance were the super-tall and super-stylish Amar'e Stoudemire of the New York Knicks and Grey's Anatomy star Jesse Williams. But despite the sizeable difference between the sports studs and the Biebs, he didn't shrink into the background. Justin Bieber brought his entourage (minus Selena Gomez) in tow and hooked up some free swag, such as Xbox games, Skullcandy headphones, Fly Society gear, shoes by Native and more. Talk about a slam dunk! The guests at the ESPN Style Studios also showed off their competitive side by playing ESPN3 Sports Video games. Wonder how Bieber scored without Gomez by his side cheering him on? It was back to business (well, sort of) at the ESPY Awards in L.A., where Justin Bieber and Selena Gomez didn't show up as a couple for the red carpet, but they did sit together in the audience. That is, until Bieber made a quick-change out of his all-black ensemble into a racing jumpsuit that conveniently advertised his new Someday fragrance. The reason for the wardrobe switch, other than the blatant self-promotion? Bieber joined race car driver Danica Patrick on stage to present an ESPY Award to the Dallas Mavericks. And, as for his racing costume? Completely necessary. After all, he had some serious sports stars to stack up to. Justin Bieber's debut fragrance has generated over $3 million in sales in just three weeks and could become the best-selling perfume of 2011. Justin Bieber's debut perfume looks set to become the top-selling perfume of 2011. 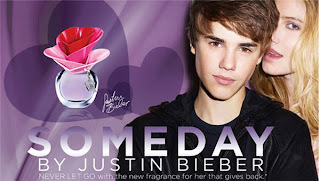 The 17-year-old singer's women's scent, Someday, generated more than $3 million in retail sales at Macy's in New York in under three weeks and experts are already hailing its debut on June 23 as the most successful celebrity fragrance launch in history. Karen Grant, vice president and senior global industry analyst of the NPD Group Inc., said: "If it sustains this momentum, it will become the number-one-selling fragrance of 2011. We haven't seen anything like it since [Jennifer Lopez's] Glow and [Britney Spears'] Curious." To launch the fragrance, Justin made a personal appearance at Macy's, where the first 325 fans who purchased the $135 Someday gift set had their pictures taken with the 'Baby' hitmaker and the store believe the star's presence propelled the fragrance's high sales. Terry Lundgren, chairman, president and chief executive officer of Macy's Inc., told WWD: "Justin Bieber's Someday fragrance, propelled by Justin's incredible personal appearance at Macy's Herald Square, has resonated with our customers, and has now become the biggest celebrity fragrance launch on record." Following's its success in Macy's, other US stores - including Dillard's, Boscov's, Belk, Nordstrom, Lord & Taylor, Sephora and Ulta - are now stocking the fragrance, while it will also be sold overseas, including in the UK, Australia, Germany and New Zealand. The fragrance was created through Give Back Brands - a company designed for entertainers to use to raise money for good causes - and the proceeds will go to several charities, including the Make-A-Wish Foundation and Pencils of Promise, an initiative which builds schools. Robert Hollander, president of Give Back Brands, said: "Justin Bieber Someday has launched to numbers that are nothing short of astounding, making this the industry's single most successful celebrity fragrance launch. Our retail partners simply cannot keep it in stock. Justin has truly made his mark on the fragrance industry, and we could not be more proud of this partnership." Justin Bieber Wears a Glittery V-neck Sweater! Justin Bieber Justin Bieber isn't afraid of a little shimmer! Justin donned a black v-neck sweater over a button-down for this preppy yet thug style. Justin paired the look with his favorite baggy black jeans. He threw on a pair of studded high-tops to complete his look. What do you think? Do you love the sparkling side of the Biebs? Will Justin Bieber Sneak Off For A Ski Trip With An Older Woman? Olympic skier Lindsey Vonn wanted a picture with Justin Bieber at the ESPY Awards for her Facebook page and her wish was granted. But Justin wanted something from Lindsay in return! If you tuned into the ESPY Awards on July 13, you saw that highly-acclaimed Olympic skier Lindsey Vonn, 26, asked Justin Bieber, 17, for a picture. Always happy to please his fans, Justin was a good sport and agreed to take a picture with the Olympic award-winning athlete. Justin is already notorious for his skills in basketball and golf, so it only makes sense that he should take his athletic abilities to the slopes. And who better to teach him than Lindsey Vonn? She’s won Olympic gold and bronze medals, two World Championship gold medals in 2009, and three overall World Cup titles, making her the most successful American skier in ski racing history! 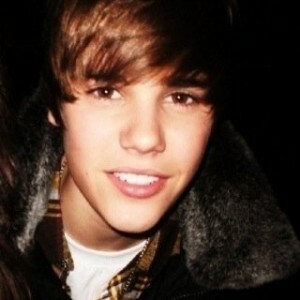 Justin could even have fun with it and take girlfriend Selena Gomez, 18, for a romantic weekend skiing trip! Wouldn’t that be adorable? From Halle Berry to Paris Hilton, lately it seems like celebrity stalkers are everywhere! At the 2011 ESPYS, The Insider's Kevin Frazier caught up with the biggest names in sports and entertainment to get a star's take on the frightening trend in Hollywood that is unfortunately becoming very real. "It's hard sometimes," admits Justin Bieber. "A lot of my personal stuff gets hacked and it's really crazy that people want to get to know me and get inside scoops and stuff." He goes on to tell Kevin he "constantly" has to change his e-mail and twitter passwords to protect himself. Regardless, Bieber says the intense fan attention is "crazy," but he "chose this life." Erin Andrews, who survived a very public battle with an obsessed stalker, believes the crime should be taken more seriously, citing her own 2009 case for which a man who secretly taped her naked received a measly two-year sentence. Andrews pleads that the likes of Jennifer Aniston and Uma Thurman use their "powerful voices" to boost awareness and strengthen the laws against stalkers. Watch the video to hear even more from Justin and Erin, as well as many more stars with their own stalker stories. Justin Bieber has become one of the first people to pass 11 Million followers on Twitter. The 17-year-old reached the enormous amount of followers this week, making him No. 2 on the list of most followed celebrities, one place ahead of US President Barack Obama, proving that he may well be the most powerful man in the world. Yet despite his huge following, Justin is still behind the Queen of Pop, Lady Gaga. Posting a message to his followers, Justin said: "#11MillionBeliebers! I LOVE YOU ALL!! THANK YOU....tonight was already a fun great night and now it is even better. THANK U THANK U THANK U"
Earlier this week, the Biebster sparked debate about his relationship with Selena Gomez after posting on Twitter: "I'm not sayin your the one girl, I'm just here to have fun girl," causing many people to think that things aren't serious between him and the former Disney star. However, we think he may be kidding, as we saw earlier today, Justin is reportedly insecure in his relationship. He might not be a sports star but Justin Beiber is such a huge sports fan he managed to get an invite to the 2011 ESPY Awards last night. And it seems that the Canadian singer wasn't just content with mingling with elite athletes but wanted to look like a professional too - sporting a racing driver jumpsuit as he took to the stage to present an award. The Canadian singer arrived at the bash in a sparkling V necked jumper and a pair of shiny black trousers as he walked the red carpet solo. Inside the awards ceremony at the Nokia Theatre LA Bieber took his seat next to his girlfriend Selena Gomez and the pair were seen cosying up together. Disney star Selena, 18, went for a racy look in a pair of very short black shorts, a black satin corset top and a sheer black blouse. 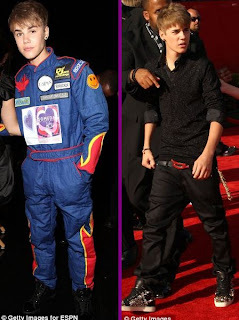 Justin, who recently played in an NBA All-Star game back in February, was invited to present an award at the prestigious Sports bash and didn’t disappoint when he appeared on stage in a racing driver jumpsuit. The Baby singer co-presented the Best Team award to the Dallas Mavericks with professional race car driver Danica Patrick who was looking stunning in a short ruffled satin dress. And Danica replied: ‘Just put them down by your side Ricky Bobby,’ alluding to Will Ferrells character in the film Talladega Nights. But Selena certainly seemed to like her boyfriend’s style and was seen cosying up to him as they watched the rest of the awards – and she wasn’t the only one. U.S. Ski Team's alpine champion Lindsey Vonn also appears to be a Belieber and when she was presented with the award for Best Female athlete she used her time on stage to make a special request to the singer. And it seems that almost everyone is a Bieber fan with the singer racking up over 11million Twitter followers last night. He added: 'we are a family....never say never. DREAM BIG!!!! Make it big you get to hang with others who made it big. From Lindsey Vonn to Dirk Nowitzki, Justin Bieber was with sports stars at the 2011 ESPY Awards. It comes with the territory, be a star in one area and you get to hang with stars from another. For not the first time Canadian singing teen Justin Bieber spent time with some of the world's best athletes. Bieber wasn't just in the audience at the 2011 ESPY Awards in Los Angeles on July 13 2011 but got to present an award there. Bieber attended the awards night with girlfriend Selena Gomez and he mostly sat in the audience and watched sports stars onstage, or at least he did until he came out on stage to present an award. Along with famed NASCAR race car driver Danica Patrick, and dressed in a spiffy race-car driver outfit, he presented the award for Best Team for 2011, which went to the NBA Champions Dallas Mavericks. The Justin Bieber and Selena Gomez dating news and gossip continues as the couple was originally believed not to be attending the 2011 ESPY Awards together. While Bieber was seen solo on the red carpet, the couple was there together for another awards show date night! Hollywood Life reports that Selena Gomez was very incognito for this event. Gomez apparently skipped out on any photo ops on the red carpet but was later shown on camera inside the theater with her main squeeze, Bieber. It's good to see the cute young couple enjoying sports and sports-related events together. At first, Justin Bieber appeared alone at the ESPYs, as he was shown on the red carpet. According to 2Cool Zap2it blog, though, Justin Bieber and Gomez arrived to the Nokia Theatre in Los Angeles separately on July 13th for the show. Bieber was scheduled to be a presenter for the ESPY Awards show and was also shown multiple times among screaming fans on the red carpet. The camera caught him laughing inside the theater during host Seth Meyers' jokes in the monologue as well. This was a good move by Justin Bieber and Selena Gomez based on what this awards show is all about. In the past they were the talk of the town at music awards shows, but this is a whole different venue. The ESPY Awards celebrate the best achievements in sports during the past year. Neither Bieber nor Gomez are athletes per se, although Bieber is certainly a hockey fan, and they've been seen together at sports events. Not to mention Bieber was also MVP of the NBA All-Star Celebrity basketball game. Sorry, though, Bieber, no awards yet for best attempt at sports by a non-sports playing celebrity! Wednesday night saw the Dallas Mavericks and their star player Dirk Nowitzki take home top Excellence in Sports Performance Yearly Award (ESPY), capping a year that saw them become improbable champions. The Mavericks, who won the National Basketball Association championship over a Miami Heat team filled with superstars, including LeBron James and Dwayne Wade, won the Espy for best team and Nowitzki was named best male athlete, reported Reuters. "If this Dallas Mavericks team proved anything, it's that good guys do win and can win and will win," said team owner Mark Cuban on stage accepting the team honor. Accepting his award for best male athlete, German-born Nowitzki acknowledged the uncomfortable scene at the awards saying he would like to thank Cuban, but couldn't "since I can't talk to him." Olympic and World Cup champion skier Lindsey Vonn picked up the trophy for best female athlete for the second straight year. Like others, she thanked numerous people, but then Vonn looked at pop star Justin Bieber in the audience and asked "will you take a picture with me for my Facebook page." Bieber laughed and nodded yes, said the report. Check out the pictures of the sizzling hot athletes as they appear for the awards function. Pop superstar Justin Bieber has a rather unique connection to the upcoming American adaptation of "The X Factor" -- and, it has nothing to do with Simon Cowell. In addition to Reid and Cowell, the other two members of the panel include Nicole Scherzinger and Paula Abdul. While Simon and Justin did meet on the British version of the show, there is some question as to whether or not Justin is altogether pleased with his "crush" Cheryl Cole no longer being on the panel. Heads up Beliebers! Your favorite teenager might be back on the market soon! According to reports, Disney starlet Selena Gomez has come right out and has said that Justin Bieber is not “the one”!! While we wouldn’t expect them to get married anytime soon, or at all, why would someone come right out and say that? That is, unless they had other plans, perhaps? Is Selena going to break up with Justin??? They are a cute young couple, but she has fielded a lot of death threats and hate-filled remarks from his fans, so perhaps it’s just getting too much for her? So what does this mean for Jelena? They are young and in love, but will it last? After all, didn’t he say she was “the one” for him, even though he’s only seventeen? Justin Bieber has a new rapidly growing fan base--adult women. Just like their tween and teenage counterparts, the new beliebers just can't get enough of their idol, despite the fact that most of them are 2 1/2 to 3 times his age. That's not a misprint. Two and a half to three times his age. Of course, adult women have been known to succumb to Bieber fever before. And some of them were famous. But unlike 23-year-old actress Evan Rachel Wood, who has publicly called the Teen Dream her secret crush, and has even copied his new hairdo, the new beliebers' average ages range from 40 to late fifty-something. In fact, this new group of JB admirers has been dubbed the Boomer Beliebers. Cute. Reportedly, more than 3/4 of all Justin Bieber fans can be divided into 2 groups: under 17 and over 40. Unbeliebably enough, the over 40 group accounts for 21 percent of all Bieber devotees. Interestingly, many of the over 40-year-old beliebers discovered JB through their daughters or granddaughters. A 48-year-old woman named Marlys, for example, listens to her favorite JB song, Overboard, on her 14-year-old daughter, Maddie's iPod while she works out. She also loves dancing to his music. She claims she admires his strong family values. A similar Boomer Belieber named Grace, age 54, got turned on to the Never Say Never guy when she bought her 8-year-old granddaughter one of his CDs. Grace thinks of the Biebs as "a young Donny Osmond—the cutest little guy." O.K. So why are "females two to three generations apart" becoming obsessed with the same teenage pop star? Apparently, there's an answer to that too. A scientific one. According to Dr. Tony Little, the culprit is estrogen. Prepubescent girls have low estrogen. Ditto for menopausal or post menopausal women. Unlike women in their later teens, twenties, and thirties, whose higher estrogen levels cause them to be attracted to masculine-looking men, females with low estrogen levels prefer men with "more feminine faces." Hence, both the tween and boomer beliebers are turned on by Justin Bieber's "boyish looks." Chipmunk has revealed that he wants to work with Justin Bieber because he "respects him". The 'Champion' MC, who has collaborated with US stars including Chris Brown, Trey Songz and Keri Hilson, said that he admires Bieber's collaboration with Breezy. In a chat with the Daily Record, the 20-year-old said: "I really respect him and enjoy what he does. I think the Chris Brown collaboration is brilliant. I'd work with him any time. Call me." Chipmunk hit the stage with P Diddy last night as part of the Orange RockCorps gig at Wembley. It was a surprise appearance, where he performed his number one single 'Champion'. Selena Gomez sent Beliebers into a frenzy earlier this year when she teased fans about the possibility of a duet with her toyboy Justin Bieber. And now a soppy collab could really be on the cards after the pair were caught practicing their harmonies during a karaoke sesh in LA! YouTube has confirmed that Justin Bieber’s ‘Baby’ video will not be deleted from the site. Fans of the artist — Beliebers — responded in throngs on Monday to reports that a YouTube term of service would call for the video’s removal. They took to the Internet, using the hashtags #dontdeletebaby and #DearYouTube to create a petition of sorts on Twitter. The ‘Baby’ video, which has amassed well over half a billion views, has also garnered over 1.5 million ‘dislikes’ on the site — a significant amount more than its 750,000 ‘likes’ and enough to cause fear that the video would be deleted. Many assumed that since YouTube is a Google service and Google and Justin Bieber just worked together, there was no way the video would be removed. Still, panic ensued, and Beliebers were quick to defend their idol, threatening to, among other things, boycott YouTube in Bieber’s honor. Predictably, the Beliebers are being criticized today for their overreaction (read: hysterical mania) to the incident. While this may be true, consider Biebs’ fan base: roughly 10 million teenage girls. There is no one on this planet who will overreact faster than a teenage girl*. Now multiply that by 10 million. It’s easy to see how the fever pitch reached the heights that it did, but fear not, Beliebers. ‘Baby’ isn’t going anywhere. * I come in peace and mean no disrespect to you, teenage girls! I used to be one of you! 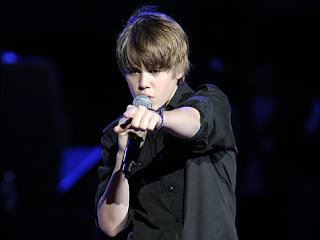 Who’s the 17-year-old Canadian singer that every teenybopper girl wants to marry and every rapper wants to work with? It’s Justin Bieber! In the heart of most rappers is a pop star dying to get out. Maybe that’s why so many hip-hop artists have taken such a liking to the pop phenom Justin Bieber. Co-discovered by Usher and signed to Island/Def Jam by L.A. Reid, the 17-year-old Canadian star received a Best New Artist nomination from the BET Awards last year and won four American Music Awards, including Artist of the Year. A bit stranger seeming is the endorsement he’s gotten from some of rap’s biggest MCs. During the past year, he has collaborated with Ludacris, Kanye West and Raekwon. He struck up a friendship with teenage Young Money rep Lil Twist and was the titular subject of a Lil B song. And sometimes, when the mood is right, he even busts rhymes himself, under his own MC name, Shawty Mane. XXL: How long have you been listening to hip-hop? Justin Bieber: I’ve been listening to hip-hop, basically, since I was, like, like, three. My mom listened to a lot of Ma$e, and my dad introduced me to Tupac when I was, like, like, four. Oh, Tupac? So you were a Tupac fan early on. Yeah, I was a Tupac fan. Did you ever believe any of the conspiracy theories that he might be alive? Or think he might come back? No, I don’t think so. I think he’s dead. What about when you got older? Do you still listen to him as much? Yeah. I mean, I’m still a huge ’Pac fan. But when I was, like, eight or nine, I could rap all of “Thugz Mansion.” Like, the whole song. My dad taught me. So was it a big deal for you at all when you started to meet rappers? Yeah. I was a big Ludacris fan, and then I was able to meet him in Atlanta at his restaurant. And I was freaking out. It was a crazy moment for me. Then I got to do a song with him, which was incredible and just a great experience. Probably my favorite rapper now, right now, at this moment, is probably Lil Wayne. How do you pick your favorite? What do you base it on? Just the stuff they do. Like, he’s on a lot of songs and some of them get repetitive, but usually he’s on. You play around and rap, but do you ever see yourself trying seriously? [Laughs] Not really. I just do it for fun, but nothing serious. I don’t think people would take me seriously if I came out with, like, a rap album. In the beginning, did you ever get intimidated by rappers? ’Cause it’s a whole different genre of music from yours. It’s fascinating how you have been so accepted by all the rappers. Your being so young and from a genre of music that’s so different, it seems pretty cool. It looks like you and Lil Twist are really cool with each other. He’s, like, one of my best friends, actually. I was just with him last night, at the basketball game, and he’s just a really cool guy. He’s really talented, and everybody should know about Twist. Both Asher Roth and Drake have spoken about giving you advice and mentoring you. What kinds of things do they tell you? Just to keep a straight head and make sure to always, um, keep family first. Basically, just regular, normal stuff. The ESPYs, which air tomorrow night on ESPN at 9PM ET, will be dominated by the Justins of the entertainment world — Timberlake and Bieber, that is. While JT filmed a promo spot for the Capital One Cup award that he will be on hand to present, the Biebs issued a tweet letting his fans know that he will also be on site to present an award. Bieber tweeted this message: “might have to stop by the @espys on wed in LA….who wants to meet me at the red carpet…maybe i will give 2 of my tickets away.” That sounds like an invitation, Beliebers! It was not revealed which ESPY Bieber will hand out, but we’re sure the fact that he will appear on the show will cause a gaggle of pre-teen girls to tune in, spiking the show’s ratings and skewing the demographics in an unconventional way. It’s not like the show is targeting females, 12-16, but with the Biebs making an appearance, that could all change … For a few moments, at least. Tune in tomorrow night at 9PM ET to watch Timberlake and Bieber surrounded by some of your favorite athletes. Sports lover Justin Bieber will be presenting an award at the 2011 ESPYs on Wednesday night, and if you live in L.A., you could be getting into the event, courtesy of the Biebs himself. "It's official...Im going to the ESPY's on Wed in LA," the 17-year-old singer tweeted on Monday. "Meet me on the red carpet and maybe i will give away some tickets. thanks!" Justin has been known to give away plenty of tickets to his own concerts, so we're sure he'll come through on his tweet. Those who want to catch a glimpse of JB and get the chance to score free tickets, should get to the Nokia Theater nice and early. ESPN's ESPY Award, which stands for Excellence in Sports Performance Yearly Award, is presented to the best of the best in sports and sports-related entertainment. The 19th annual awards show will be hosted by 'Saturday Night Live's' Seth Meyers and air on ESPN on Wednesday, July 13 at 9 p.m. ET, so if you can't make it in person, set your DVRs! Already a successful documentary film, Justin Bieber’s flick, “Never Say Never,” hits the streets Friday (August 15) on DVD. The film is an in-depth look at Bieber’s meager beginnings as he puts in the work to become a pop megastar. It features interviews and concert footage, and as Bieber once explained to MTV News, he hopes it finally quiets his haters who might think he’s some pre-packaged pop phenom. The film is an eye-catching look at the life of the star, and there are some very memorable moments. Here are our Top 5. 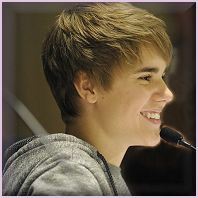 OK, the hair really did help make Bieber a star, and in a pre-haircut world, those bangs had girls swooning. Turns out, when you have Bieber swoosh his bangs around in slow-motion 3-D, it really puts butts in theater seats. Going home with Bieber is particularly interesting (you get to see his childhood bedroom! ), but seeing him play with his grandfather’s stuffed dead animals, well, that’s priceless. Whether he’s singing on a stoop or meeting with Usher, these vintage clips paint a picture of a young man dedicated to getting his voice heard. They help shape the story of Bieber’s life and the movie’s arc. Getting to know the men and women who work tirelessly to keep Bieber happy really gives fans the nitty gritty of what it takes to keep the Bieber machine on track. Never been to a Bieber concert? No problem. These glittery 3-D moments give viewers a perfect idea of what a Bieber show is like: screaming fans, A-list cameos (Miley Cyrus, Usher) and all.